It’s very important for children to brush their teeth at least two times during the day with bedtime being the most ideal time to get hold of a toothbrush. But what if your child is a reluctant tooth brusher? Is there anything you can do about making him or her more comfortable with the entire experience? Be enthusiastic and encourage your child as much as you can! Young children love when they watch their Mum and Dad getting excited about tooth brushing. Giving children the chance to watch their parents brush their teeth from an early age is also a good idea for making them learn oral hygiene practices at a younger age. 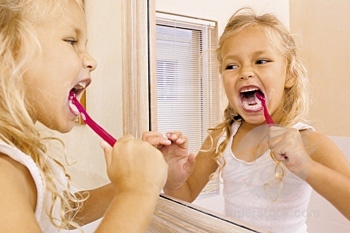 Repeated warnings should be given to remind the child that brushing time comes before bedtime. Never ask your child if he wants to brush his teeth. Just tell him that you’re going to brush his teeth or he should do it on his own. Try to get some colorful, fun-looking toothbrushes as many children prefer having toothbrushes that are either character-themed or have special features like flashing toothbrushes that actually function by lighting up for a minute.